Achill is bordered by a river and overlooks the magnificent strand with out-of-bounds coming into play on the 4th and 5th. Achill's signature hole is the 6th at 361 yards it is the most difficult hole on the course. 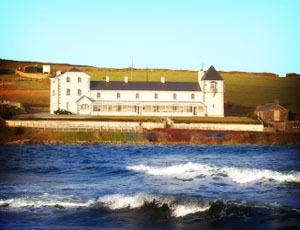 The clubhouse is basic but this is more than compensated for by the warm West of Ireland that the members extend to visitors by the members who will remind you that the rest of Ireland is the Island and that you are really on the mainland! Achill Island Golf Club was founded in 1951 and was designed by Paddy Skerritt the resident professional at St. Anne's until his death. Paddy laid out a fine 9-hole links in this most scenic part of the country.